House MD Episode Guide: Season Two #221 "Euphoria Part 2"
Second Season Episodes :: #221 "Euphoria Part 2"
so after reading the ones below, click on the "Search" button above to search for "221". Dr. Foreman in the HOUSE episode "Euphoria, Part 2"
Wednesday, May 3 (8-9 PM ET/PT) on FOX. They don't have a diagnoses so House decides to treat for everything. Then he exposes Steve McQueen (his pet rat) to the cop's apartment planning to autopsy his brain when he gets sick. House does try to get at the body of the cop, watching in case the guard never leaves his post. The parasitic ameba Naegleria, which had infected a cistern that he used to irrigate his marijuana plants. Disagnosed by House finding the cistern and Cameron taking a piece of Foreman's brain at the same time. A mother brings in pre-school girl who she thinks has seizures when she is in her car seat and she thinks it is epilepsy. House says it is called "gratification disorder. Sort of a misnomer. If one was unable to gratify oneself, that would be a disorder." The mother thinks this is "horrifying. Epilepsy is horrifying. Teach your girl about privacy and she'll be fine." It seem House is doing lots of clinic hours this afternoon. Wednesday, May 3 (8:00-9:00 PM ET/PT) on FOX. Guest Cast: Charles S. Dutton as Rodney Foreman; Scott Michael Campbell as Joe; Leigh-Allyn Baker as Claire; Amber DeMarco as Rose. The lyrics are available from a website about Marc Cohn. House, storming into Cuddy's office after the first patient dies: "I need a bone saw." Cuddy: "I'm sorry... I wish I could." House: "I just want a little tiny slice of this guy's brain. That's all I need. Just enough to tell me what's killing Foreman." Cuddy: "A thin slice of Joe's brain could also cause a public health crises." House: "It's not a good idea to scream fire every time somebody lights a match." Cuddy: "Don't downplay this, House. You put both of them in isolation for a reason. Joe's death elevates this situation to a biosafety level three." House: "Oooh level three You should call Jack Bauer." Cuddy: "I called the CDC. House: "Well, tell them I'll be really, really careful." Cuddy: "We don't have the proper equipment for you to be really really careful. You can do whatever you want to Foreman but the CDC will do this autopsy." House: "Whatever. The point is we'll be lucky to get results in three days." Cuddy: "I told them how urgent this is." House: "And they told you?" Cuddy: "We'll have the results in three days." House: "Aw. That's a shame.Because Foreman will never get to know what it was. He'll be dead in 36 hours. Maybe this is a toxin. Maybe it's not contagious at all. You're killing Foreman because of a maybe." Cuddy: "Well, you have 36 hours to figure out which one it is." Wilson coming to ask House how Foreman is doing and finding him staring at a computer: "You're accessing a webcam?" Wilson seeing the screen which shows Steve's cage: "Is that your kitchen?" House: "Well, obviously, I couldn't bring him here. He's been exposed to whatever Foreman's got." Wilson: "You infected Steve? Why didn't you just get a rat from the pet store?" 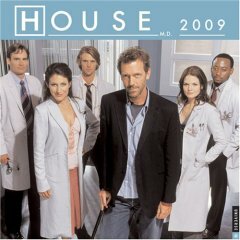 House: "Because I needed one with a clean medical history. 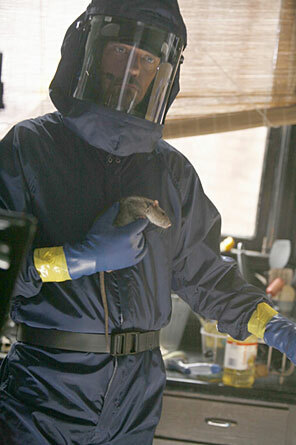 Who knows what kind of antibiotics they give those rats?" Wilson: "So, this is your plan. Just sit here and watch your rat all day?" House: "Well, it shouldn't take long.... As soon as he gets sick, I do an autopsy." Wilson: "As soon as he's dead." House: "Right after he gets sick, there's a good chance he'll get hit in the head with a cane shaped object." Wilson: "Normally, you just use your patients as lab rats. It's a nice change." House: "First symptom is euphoria." Wilson: "How do you know if a rat's euphoric?" Cuddy complains that House is seeing clinic patients: "One afternoon and you're on pace to set the record for most patients seen in a month." House: "You're upset because I'm doing clinic hours. Wow. That is so like rain on your wedding day." Cuddy: "For the last three hours I've been on the phone with the CDC...."
House: "Yeah, how's that going by the way?" Cuddy: "They promised to expedite..."
House: "Tough to do an autopsy when they haven't even picked up the body yet.... I go watch the meds drip into his IV. You think that will make the treatment work faster?"" Cuddy: "Go to your office. Play with ball. Write on your whiteboard. Insult your team. Do whatever it is that you do to figure things out. House: "Feeling guilty? It's not too late to change your mind. Go call the CDC. Tell 'em you were just joshing." Cuddy: "Keep avoiding Foreman's case until he dies. Then I'll drown in guilt."